In the past luxury usually meant ostentatious displays of heavy ornamentation. But the modern definition of luxury doesn’t have to mean sumptuous or overblown style. Refined architecture and interior design are the contemporary way to create a sense of luxury. Luxury Houses City shows us a beautiful selection of residential projects from cities around the world, where we can see luxury based on well-chosen details. All these stunning spaces show that a more restful and sophisticated ambience is the hallmark of contemporary luxury. Cristina Paredes lives and works in Barcelona, where she graduated with a degree in Fine Arts. She has collaborated with several publishing companies and has worked as a picture editor at various photo agencies. 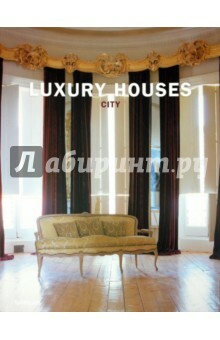 A comprehensive study of truly luxurious city dwellings, by some of the world’s most creative designers and architects The most interesting examples of high-end urban design from around the world, all in one place Text in English, German, French, Spanish and Italian. отлично подобранных деталях, которые можно увидеть в этой книге.